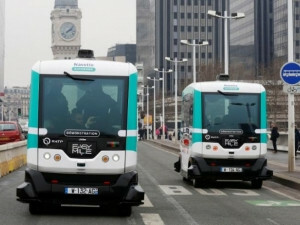 Two self-driving electric minibuses in Paris, France. Carmakers and suppliers yesterday gave widely differing timelines for the introduction of self-driving vehicles, showing the uncertainties surrounding the technology as well as a split between cautious established players and bullish new entrants. Chipmaker Nvidia, facing direct competition with the world's top chipmaker after Intel's $15 billion deal to buy autonomous driving technology firm Mobileye this week, gave the most optimistic predictions. Chief executive Jen-Hsun Huang forecast carmakers may speed up their plans in the light of technological advances and that fully self-driving cars could be on the road by 2025. "Because of deep learning, because of artificial intelligence (AI) computing, we've really supercharged our roadmap to autonomous vehicles," he said in a keynote speech to the Bosch Connected World conference in Berlin. Germany's Bosch, however, the world's biggest automotive supplier, gave a timetable as much as six years longer to get to the final stage before fully autonomous vehicles, and declined even to forecast when a totally self-driving car might take to the streets. Progress is fraught by issues including who is liable when a self-driving car has an accident, bringing down the costs of sensor technology and guarding against hacking. "Of course, we still have to prove that an autonomous car does better in driving and has less accidents than a human being," Bosch CEO Volkmar Denner told a news conference. Nvidia has applied its expertise in high-end computer graphics to the intense visualisation and simulation needs of autonomous cars, and has been working on artificial intelligence - teaching computers to learn to write their own software code - for a decade. "No human could write enough code to capture the vast diversity and complexity that we do so easily, called driving," said Huang. Together with Bosch executives, Huang presented a prototype AI on-board computer that is expected to go into production by the beginning of the next decade. The computer will use Nvidia's processing power to interpret data gathered by Bosch sensors. On the way to fully self-driving cars, levels of autonomy have been defined, with most cars on the road today at level two and Tesla ready to switch from level four to five - full autonomy - as soon as it is permitted to do so. Level three means drivers can turn away in well-understood environments such as motorway driving but must be ready to take back control, while level four means the automated system can control the vehicle in most environments. Independent technology analyst Richard Windsor wrote in a note this week he doubted automakers would have autonomous vehicles leaving factories by a typical self-imposed deadline of 2020, mainly because the liability issue was unresolved. "This is good news for the automotive industry which is notoriously slow to adapt to and implement new technology as it will have more time to defend its position against the new entrants," he wrote. But Nvidia's Huang said he expected to have chips available for level three automated driving by the end of this year and in customers' cars on the road by the end of 2018, with level four chips following the same pattern a year later. That is at least a year ahead of the plans of most carmakers that have an autonomous-driving strategy. The head of autonomous driving at BMW told the conference the luxury carmaker was on its way to deliver a level three autonomous car in 2021, but could produce level four or five autonomous cars in the same year. "We believe we have the chance to make level three, level four and level five doable," he said. He told Reuters the decision on which levels to release would depend in part on the market, and that cars with more autonomy might first be produced in small batches for single fleets. Bosch said it saw level three vehicles being released with its on-board computer at the end of the decade, and level four driving not before 2025. Uber, Baidu and Google spin-off Waymo are testing self-driving taxis, while carmakers including Volvo, Audi and Ford expect to have level four cars on the road by 2020 or 2021. Nvidia's Huang predicted those plans would speed up: "In the near future, you're going to see these schedules pull in."